This summer, I bought a Chumby as my birthday present for myself. 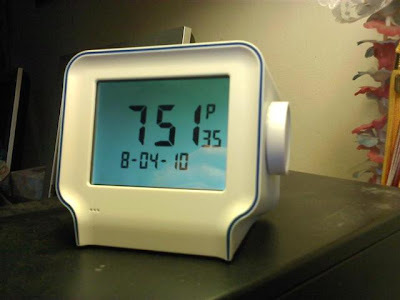 For those who don't know, the Chumby is an internet-connected alarm clock, meaning my desk-side clock can do such fun things as scroll by my most recent email, play Pandora, and display the weather forecast. I opted for the Chumby One, saving me a little money compared to the Classic and it better matches my style, I feel. Click here to visit my Chumby! Most importantly, the Chumby runs Linux. 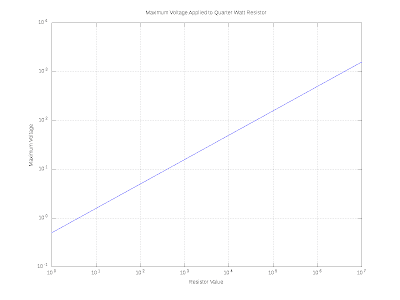 Much like the games I've been playing with my WRT54G[L] routers, this means I can make the Chumby do so much more than it's originally presented to do. The one that particularly interested me, for no good reason, was getting a web server setup on the Chumby. To think that I was server a website from my alarm clock is just the kind of ridiculous idea I revel in. The (outstanding) Chumby wiki already has excellent documentation as to how to setup lighttpd as the web server on the Chumby, but has the one short-fall of all being contained on a flash drive which has to stay plugged into the back of the Chumby for the web server to work. What I really wanted was for all of the storage to be internal to the Chumby, so that I can still pick it up and interact with it like I normally do. Fortunately, the microSD card inside the Chumby used to store the firmware has additional storage capacity, which is formatted and mounted as /mnt/storage/. Unfortunately, I timed buying my Chumby when they were building them with 1GB SD cards, which leaves about 500MB for /mnt/storage/, to be shared between this web server, and all of my mp3s that I store on it to play when my internet / wifi isn't cooperating enough to listen to Pandora. This isn't nearly enough for my taste, but I happen to have had an 8GB microSD card laying around with no use, and found instructions to upgrade the SD card inside the Chumby, which I did. Now that I have 7GB of FLASH storage to play with, it has become only a software issue, which is easy, right? Not so much. The directory prefix of the /lighty/lib folder is a compile-time option, which means the binary posted on the wiki didn't work for me (There may be a config option for it, but I didn't find it). This left compiling the entire lighttpd package from source, which turned out to not be that bad, once you get the dev environment setup, which I've become pretty good at in Linux (AVR, MSP430, WRT54G[L]). option documented in the wiki. Once the compile was complete, I scp'd the finished binary to the Chumby to finish the install. This suffers from the one shortfall of how to start it. The USB-based web server used the debugchumby script in the root of the flash drive, but with no flash drive, I have no debugchumby script there to use. Again, the Chumby wiki has an entire page devoted to documenting the different injection points for scripts to be run. Moving the sample debugchumby script to /psp/rfs1/userhook1 got my web server to start when I rebooted the Chumby. If you're not big into the whole wasting an hour of your life trying to get an ARM compiler working, here is my working binaries and scripts. The easiest way to get the tarball onto the Chumby would be to load it onto a flash drive, then SSH into the Chumby and move it around from there. Note that the crontab shipping with the Chumby doesn't default to the correct folder, so to edit the cron table requires crontab -c /psp/crontabs/ -e.
I am working on adding on to this script to have it cause a growl notification on my desktop with the day's statistics, as well as email me the raw logs, but I'm working remotely from my parent's house for the weekend, so I can't test that until next week. Feel free to do what you like with it, and let me know in the comments. I'm constantly trying to find a happy medium between current limiting resistors too large, causing too small of a current, and too small, exceeding their power ratings. 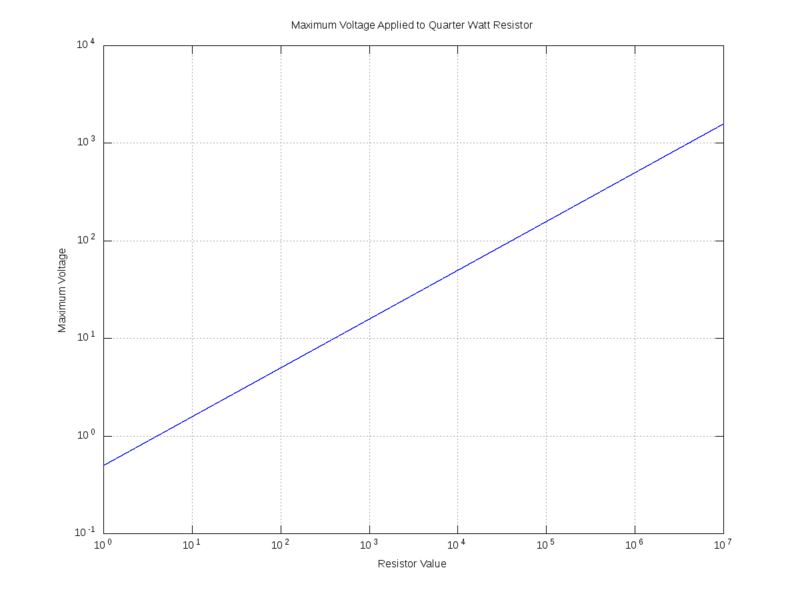 I finally got tired enough of iterating through one of these problems today that I fired up Octave and made this handy Resistor - Voltage chart for 1/4W resistors. This is why I love Octave.